A man has been left fighting for his life after a horror crash in north Belfast. Six adults and a child were taken to hospital after the crash at the Ardoyne shops in the north of the city, the Belfast Trust said. 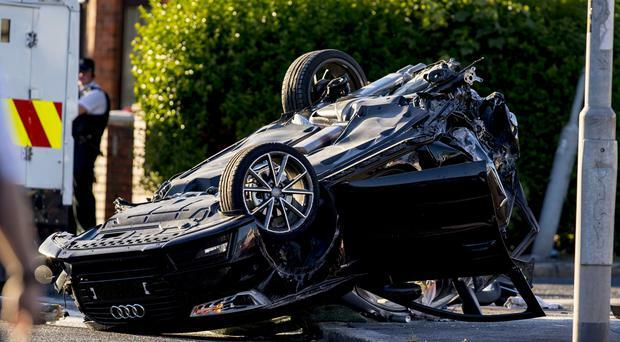 Police sources said the crash happened after the pursuit of a black Audi A1 car from the nearby Cliftonville Road on Tuesday evening. The Police Ombudsman is investigating the PSNI's involvement. The Audi hit a tree before coming to a stop with flying debris smashing an upstairs window of a nearby home just before 7pm. Six cars were involved in a scene described as "carnage". Five adults were taken to the Royal with one woman transferred to the Mater. A child was taken to the Royal Victoria Hospital for Sick Children. The woman's condition was described as "stable" while the child was discharged before 9.30pm, a Belfast Trust spokeswoman confirmed. One man was said to be "critical" while the four others were thought to be in a serious condition. In all the Ambulance Service sent 11 crews to the scene including the air ambulance. SDLP Councillor Paul McCusker was at the scene. He offered his thoughts and prayers to all those caught up in what he described as a "horrific major road traffic accident". "The scenes can't be described as anything other than carnage," he said. Police said the car was stolen from Thirlmere Gardens off the Cavehill Road in the early hours of Sunday. Superintendent Muir Clarke added: "The matter has been referred to the Police Ombudsman's Office who are currently investigating the circumstances leading up to the collision therefore it would be inappropriate to comment further pending the outcome of that investigation." The Ombudsman probe comes after a crash in April - also in north Belfast. In that police were chasing a stolen car also taken from the Cavehill Road area before it crashed hitting and killing Belfast mum Lisa Gow on the Ballysillan Road. The Crumlin Road has been reopened to traffic.